CP - Technical Note: How accurate can stalagmite formation temperatures be determined using vapour bubble radius measurements in fluid inclusions? Technical Note: How accurate can stalagmite formation temperatures be determined using vapour bubble radius measurements in fluid inclusions? Abstract. 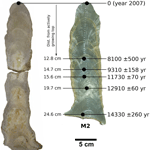 Stalagmites are natural archives containing detailed information on continental climate variability of the past. Microthermometric measurements of fluid inclusion homogenisation temperatures allow determination of stalagmite formation temperatures by measuring the radius of stable laser-induced vapour bubbles inside the inclusions. A reliable method for precisely measuring the radius of vapour bubbles is presented. The method is applied to stalagmite samples for which the formation temperature is known. An assessment of the bubble radius measurement accuracy and how this error influences the uncertainty in determining the formation temperature is provided. We demonstrate that the nominal homogenisation temperature of a single inclusion can be determined with an accuracy of ±0.25 °C, if the volume of the inclusion is larger than 105 μm3. With this method, we could measure in a proof-of-principle investigation that the formation temperature of 10–20 yr old inclusions in a stalagmite taken from the Milandre cave is 9.87 ± 0.80 °C, while the mean annual surface temperature, that in the case of the Milandre cave correlates well with the cave temperature, was 9.6 ± 0.15 °C, calculated from actual measurements at that time, showing a very good agreement. Formation temperatures of inclusions formed during the last 450 yr are found in a temperature range between 8.4 and 9.6 °C, which corresponds to the calculated average surface temperature. Paleotemperatures can thus be determined within ±1.0 °C. How to cite: Spadin, F., Marti, D., Hidalgo-Staub, R., Rička, J., Fleitmann, D., and Frenz, M.: Technical Note: How accurate can stalagmite formation temperatures be determined using vapour bubble radius measurements in fluid inclusions?, Clim. Past, 11, 905-913, https://doi.org/10.5194/cp-11-905-2015, 2015. Fluid inclusions inside stalagmites retain information on the cave temperature at the time they formed and thus can be used to reconstruct the continental climate of the past. A method for extracting this information based on a thermodynamic model and size measurements of femtosecond-laser-induced vapour bubbles is presented. 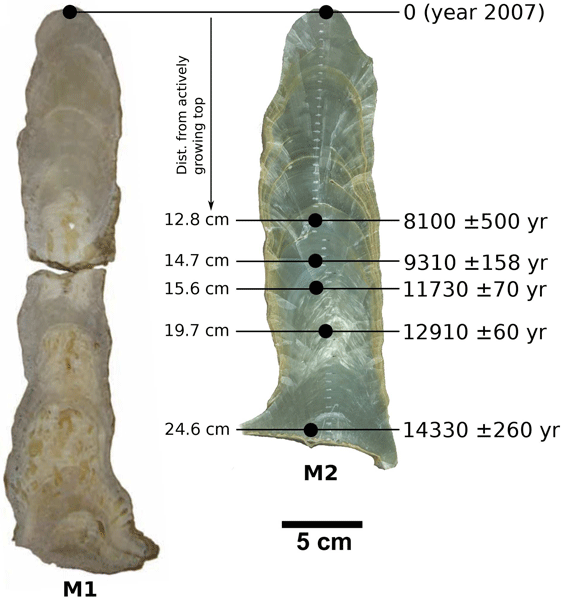 Applying our method to stalagmites taken from the Milandre cave in the Swiss Jura Mountains demonstrate that palaeotemperatures can be determined with an accuracy of ±1°C.